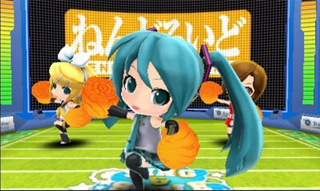 The popularity of Japanese virtual idol Hatsune Miku continues to rise in the West, giving Sega the encouragement it needed to bring Hatsune Miku: Project Mirai Remix to North America and Europe in 2015. With Project Diva F released for the PlayStation 3 and Vita and its sequel coming later this year, this next Western release for Sega's Hatsune Miku franchise marks her first appearance on a Nintendo system outside of Japan. Project Mirai Remix (working title) is an enhanced version of Japan's Hatsune Miku:Project MIRAI 2, mixing the rhythm gameplay of the Diva series with ridiculously cute tiny versions of the idol and her virtual friends. Fans have been clamoring for a Western release, and their clamoring has been heard. Here's a trailer for the Japanese version, to give you an idea of what to expect. I'm going to go be deliriously happy for a bit.